This is last of my Halloween posts! I think Halloween is one of the best baking seasons – you can do so many cute things with so many great flavors. Christmas and Halloween can’t be beat for yummies, right? 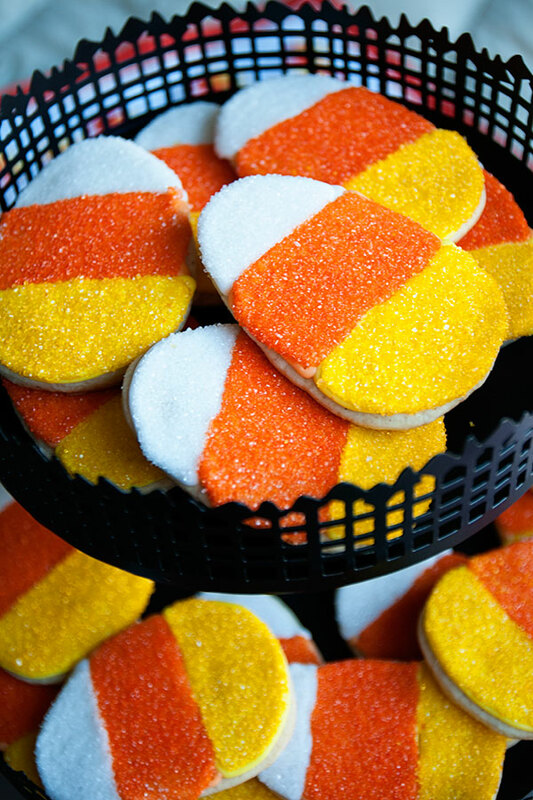 Every year I try to come up with a new way to bake something resembling candy corn — and this year it’s a simple sugar cookie decorated with sanding sugar. If you want to seen what I’ve done in years past, check out my holiday treats archive! Below are the recipes I used and the details for how to make these. Enjoy! 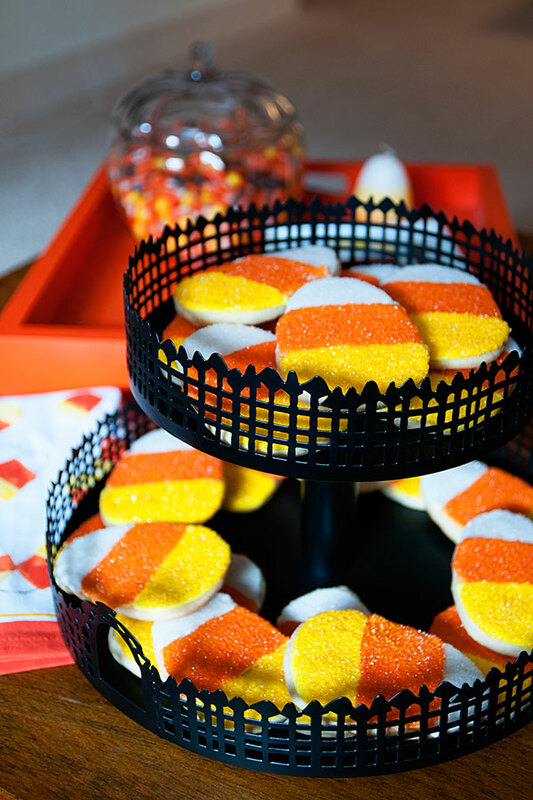 I had a candy corn cookie cutter in my stash — but you know what would also work? An Easter egg cookie cutter. Improvise if that’s all you’ve got! I made two batches of royal icing (recipe below). I dyed a portion of the icing orange, a portion yellow, and left the rest white. You don’t have to dye the icing (as you’ll be covering it up with sanding sugar), but I think the colors of the end product are richer if you do. You will need orange, yellow, and white sanding sugar, plus the required outlining/flooding supplies as described in the links above. I outlined the yellow portion of the cookies first, then the orange, then the white. Once all of the outlines were dry, I began the flooding process. Flood the yellow portions first — and dip into yellow sanding sugar. Allow the cookies to sit for about 30 minutes. Then repeat the process for the orange portion, then for the white portion. PS: the cookie/cupcake stand in the photo above is from Crate & Barrel (fall 2014). Beat butter and sugar. Add eggs, sour cream, and nutmeg. Add dry ingredients gradually. Chill the batter overnight or for at least 4 hours. Roll out dough and cut with cookie cutters. Bake at 350F until golden (in true fashion, my grandma didn’t give a specific baking time. I baked the cookies for about 8 minutes). Combine all ingredients in the bowl of a stand mixer fitted with the paddle attachment. Mix on low speed until the sheen has disappeared and the icing has a matte appearance (about 7-10 minutes). Transfer the contents of the mixing bowl to an air-tight container. This will be the stiffest consistency of the icing, and at this point it is still too stiff to use for decorating. Add water a very small amount at a time and stir by hand until fully incorporated. Continue until the icing has reached a consistency appropriate for piping. ** Note! I made two batches of this icing for this project.